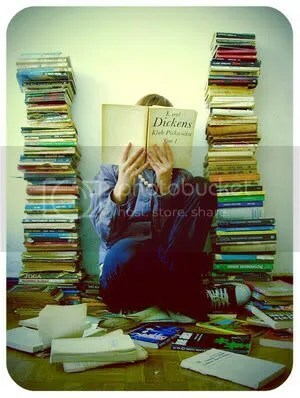 Last month Margaret Feinberg announced on her blog that she was going to challenge herself to read 75 books during 2010. She was committing herself to a year of personal learning. When I first saw this I was interested, but didn’t feel like I needed to commit to a specific number since I read A LOT! This week I started thinking about what I read and realized that it might be good for me to do a challenge. I am a re-reader. I have a handful of books that I read multiple times throughout the year: the Complete Works of Jane Austen, A Tale of Two Cities and David Copperfield by Charles Dickens, The Scarlet Pimpernel by Baroness Orczy, The Chronicles of Narnia by C.S. Lewis, to name a few. I love to re-read books. Opening a familiar, well-worn copy of one of my favorite books is like a reunion with an old friend. That being said, I have a growing list of book recommendations from blogs I follow, websites I frequent or friends and family. I buy these books, or put them on a mental list, with the greatest intention of reading them. I probably have 5 books in our bookshelf, right now, that I eagerly purchased and have since let lie there collecting dust. So I’m accepting Margaret Fienberg’s challenge for 2010, but I’m giving myself a rule: I can’t count a book I’ve read before. Now I know myself…I’m still going to re-read my favorites this year. Plus, I have a baby coming in June that could greatly limit my ability to read for a while. So, I’m setting my number pretty low; I am committing to read 35 never-read-before books in 2010. I’m now in the middle of Respectable Sins by Jerry Bridges, so that’ll be the first book on my list. Luckily I can download books using the Kindle app on my iPhone; I have a feeling that will enable me to reach my goal of at least 3 books a month. What do you think? Wanna join me? If so, click on the link above to sign up on Margaret Fienberg’s site and please leave me a comment so I know I’m not alone in this. When I finish a book I’ll most likely post a review about it here…that way you’ll know if you want to add it to your list for 2010. Also, book recommendations are greatly appreciated! You’re not alone… I mean, it’s not like I’m going to read a bunch of books with you, but I WILL totally read the reviews you post (eh, that’s support if I’ve ever seen it). I look forward to hearing your insights on some good books! Man! I can’t read 1 book in 3 months (OK, maybe it’s more like 3 books in 2 months is a fast pace for me). So people like you who voraciously consume literature make me stand back in awe. Don’t have any profound suggestions. I enjoyed “A Million Miles in a Thousand Years” by Donald Miller, but it wasn’t life changing or anything – just some food for thought. That’s the most recent “new” book I’ve read. I saw that book recommended somewhere else so I think I’m gonna have to add that to the list. Thanks! Haha! Thanks Levi! Got anything good that you’ve heard about recently? I have a few already lined up, but finding 35 *new* books to read could end up being a little difficult. What a great idea! I have LOTS of books on my bookshelf and night stand that I’ve been meaning to read, but haven’t yet. Your post is inspirting me to consider a specific goal for 2010. I like the idea that you tapered Margaret’s goal from 75 to 35, adjusting the number to your own personality and life circumstances. Now you’ve got me thinking!